Singapore Emcee and Close-up Magician Ainsley Chong is your number one entertainment choice to take your event to greater heights. Graduated from The Emcee Academy in Singapore, founded by The Flying Dutchman, he is guaranteed to leave a lasting impression on your guests and you. 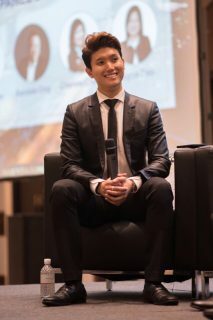 Having also had prior event management experience, Ainsley Chong understands the mechanics of being the best emcee Singapore and in turn helps you to deliver an interactive and terrific experience for your event. When you choose Emcee Singapore Ainsley Chong to be the host of your event, you can be rest assured that your event runs smoothly while your guests are engaged with games, entertained and/or awed by his voice or magic tricks.